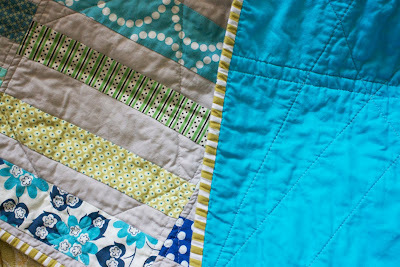 craftyblossom: a summery blue and green quilt. 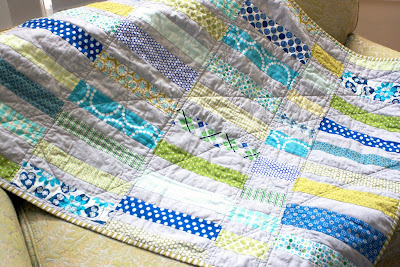 a summery blue and green quilt. Hello friends....another month has passed since my last post. ugghh. I always feel guilty about that. However, I have two full weeks off before school starts and I am bound and determined to get some crafting in before I go insane and quite possibly get thrown out of my quilting bee. 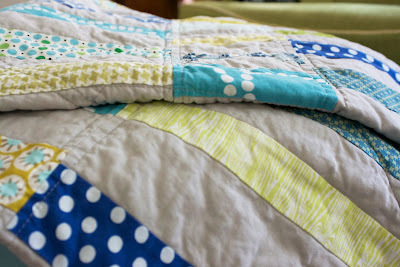 As for this quilt, I put it together nearly two months ago for a friend. It's so summery to me! I love how bright and fun the blues and greens look alongside the Kona Ash, a larger throw for myself might very well be in order. Hope you're all enjoying these final days of summer. very nice! the ash really is summery in this one! such lovely colours..and it must make you feel good to be making something after all your study..
Beautiful colors! It is so fresh looking. You're right, it looks delightfully summery. It's beautiful! Love the great color combos you always put together. 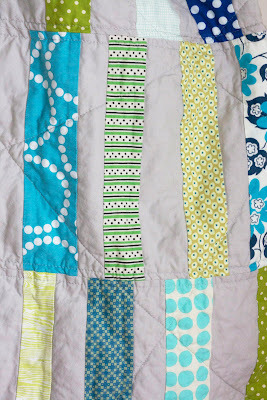 Love your random quilting lines too. Enjoy your last 2 weeks of summer! It's very beautiful, light and almost wispy. Your friend is blessed to receive it. 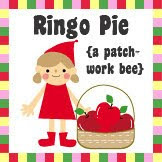 I wish I had your talent!